January is Poverty Awareness month. So come out in the cold to help Charity Benevolent Fund start to break the cycle of inter generational poverty. Some families are on their third generation of poverty and that can't be tolerated. Education is the key, but families living in poverty must have the essientials. CBF have provided individuals and families over the last seven years with clothing and hygiene kits across Atlanta, GA and Metro Atlanta. 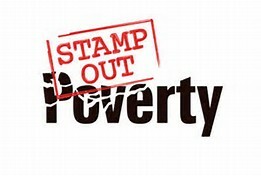 This is the 7th Annual Stamp Out Poverty 5K Run/Walk to be held at Grant Park in Atlanta, GA. Sponsorship and Volunteer opportunities are available. Contact: Larry Manuel E| cbf@mycbf.org P| (478) 444-9781 W| http://mycbf.org. Charity Benevolent Fund is asking for dry and can food donations for a food drive to help reduce the food shortage occuring in Atlanta, GA amd Metro Atlanta. Food donations are being accepted at Big Peach Running Decatur and on race/walk day on Dec 29th at Grant Park. Atlanta History Center, Big Peach Running CO, Emergin C, Road ID, and the Varsity are sponsors. Packet Pick up will be at Big Peach Running CO-Decatur 1565 Church St Ste 250 Decatur, GA 30030 from 4pm to 7pm on Dec 28th. Check in starts at 8:00 am to 8:45 am with the 5K Run/Walk stating at 9:00 am. Set UP will be at the Grant Park Oval which is next to the Zoo Atlanta entrance off of Cherokee Avenue.